In Volume 8, Issue 3 of Tactics Magazine we profiled three Shawmut customers that changed the way their organizations manage print collateral. By leveraging web-to-print technology, they’ve stripped away time-consuming order processing, inefficient distribution methods, and cumbersome sales tools. If your marketing team faces some of the same challenges, a web-to-print collateral management system might be right for you. But setting up a new process and e-commerce storefront is no easy feat. 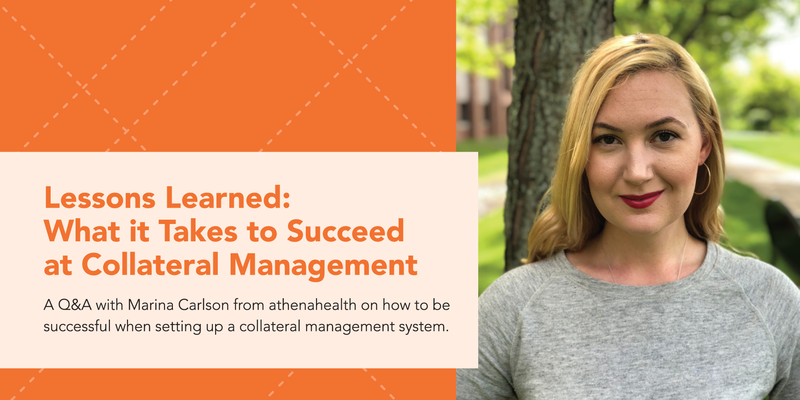 Take it from athenahealth’s Marina Carlson who shares some lessons learned during their recent transition to online collateral management. What advice would you give to other organizations looking to adopt this technology? You’ve got to figure out your business need first. For us, it was primarily sales enablement, although we will also use our new storefront for event marketing and employee needs down the line. Once we identified the primary challenge, we set out to find a solution that helped our cultivation process with prospects. The site lets our sales team send thank you notes and follow-up materials quickly to keep the conversation with prospects going. I also recommend finding a vendor that you have a good relationship with. I would not have taken on this project without it! Why do you think having a collateral management system is important? Although I love the fact that this solution makes our marketing team’s job easier, it goes well beyond that. Collateral management is good for the whole organization because it centralizes resources and makes it possible to have consistency in our brand and messaging. 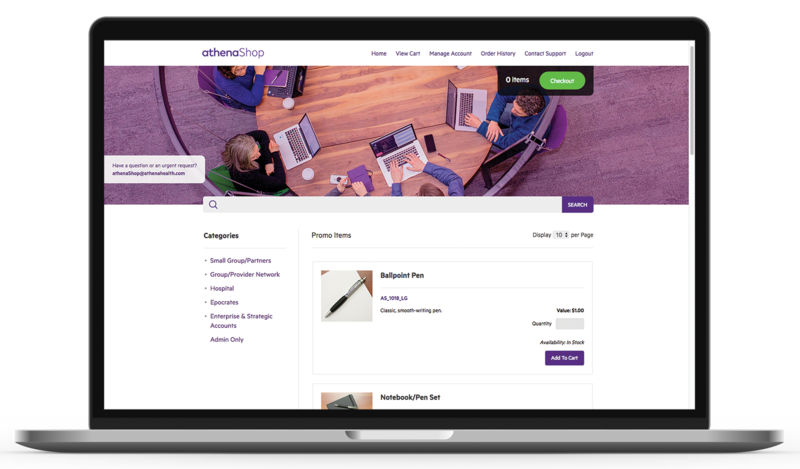 For athenahealth, that consistency is critical. Because we’re in the healthcare space, we can run into compliance issues if our materials aren’t up to date. We need to have a seamless way to manage collateral and get it between marketing and sales, because there can be legal implications if we don’t. How did you define your project requirements? Our marketing team knew our current process wasn’t working.  First, we needed a really simple way for sales to order and ship collateral. Second, we wanted a convenient way for marketing to stay on top of our in-market offers and what needed to be discontinued. 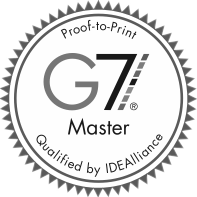 That’s what drove us towards print-on-demand (POD) capabilities and custom templates. We looked to our stakeholders on the segment marketing team (content producers) to determine which pieces should be kept in inventory vs POD items. Then we structured the website with ease-of-use in mind for sales and we’ll continue to incorporate their feedback as we move forward. How long did the site take to launch? In total it took us about six months. We started off with a few planning sessions to identify our focus areas which included promotional items, print-on-demand collateral, custom kits, and the user experience. Making sure it was easy-to-use was critical so that we did not end up with adoption challenges down the road. From there it moved pretty quickly in terms of building templates, tweaking the design, and making sure the inventory was ready and available for launch. We also set clear expectations—things didn’t have to be perfect on day 1. Like many of our projects, we used an agile approach because the system is so flexible it can easily grow as our needs change. In fact, we’re already talking about phase two. 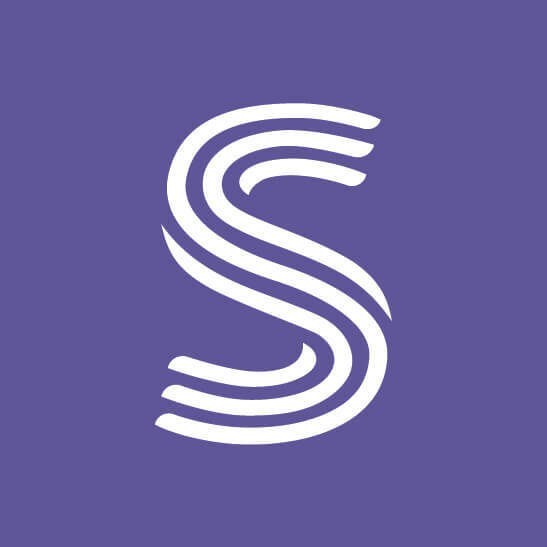 Which internal resources from athenahealth were involved? We gathered input from legal, compliance, content marketers, sales, design, and finance. It’s important to identify who is going to have skin in the project and get their buy-in sooner rather than later. We included at least one person from each team in our kickoff meeting and started by asking some of the tougher questions: What kind of tracking did we need? What type of reporting? How were we going to allocate costs? What were you looking for in a vendor? Previously we had multiple systems so the first thing we wanted was to keep everything under one roof. Working with a company that could do the website development, print, and promotional products sourcing was a must. Personally, I had never done a project like this. So I was looking for a partner, not just a “vendor”— there’s a big difference! Working with Shawmut felt like we were one team working towards a goal rather than two companies each fulfilling their individual responsibilities. The whole process was very collaborative. We’d toss out some crazy ideas and they found a way to make it happen which made the end product that much better. I couldn’t have asked for a better project team! If you had to build the site over again, what would you do differently? In the beginning, I should have taken a bit more time to review the calendar for holidays, vacation time, or other potential roadblocks. Our launch date did get pushed out slightly because of holiday delays so it’s important to account for that up front and adjust the timeline accordingly. How will the collateral management system help athenahealth moving forward? Now that we’ve launched, our next step is to conduct a user survey and implement relevant feedback. So far, the initial impressions have been quite positive and everyone loves the site design. This first phase was sales focused but in the future I see us developing tools for our event marketing team and things like employee onboarding and internal communications. What other advice do you have for companies looking to launch a web-to-print storefront? Don’t be afraid to throw ideas out there and see what the technology can do. That’s the beauty of doing something you’ve never done before—you don’t see any limitations. And fortunately, we had a great partner that was able to turn our ideas into a reality. This article first appeared in Tactics Magazine, Volume 8, Issue 5.